PULLMAN, Wash. – Internationally renowned scientist W.E. Moerner will be the second Nobel laureate to speak this year on the Washington State University campus when he presents the S. Town Stephenson Distinguished Lecture on Tuesday, April 3. Moerner’s talk, titled “The Promise and Challenges of 3D Super-Resolution Microscopy, Single-Molecule Tracking in Cells, and Trapping of Biomolecules in Solution,” is free and open to the public. It is sponsored by the Department of Physics and Astronomy and begins at 4:10 p.m. in Webster Hall, room 16. A reception will follow until 6:30 p.m. in the foyer on floor G, above the lecture hall. Moerner is a co-recipient of the 2014 Nobel Prize in Chemistry and a professor of chemistry at Stanford University. His WSU address follows the Stephenson Lecture in January by William D. Phillips, co-recipient of the 1997 Nobel Prize in Physics. 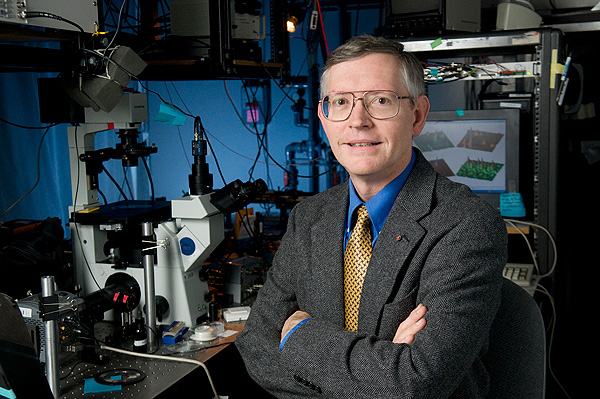 Moerner’s Nobel-winning work involved development of super-resolved fluorescence microscopy. “Super-resolution microscopy has opened up a new frontier in which biological structures and behavior can be observed in fixed and live cells with resolutions down to 20–40 nanometers and below,” Moerner said. In his WSU address, he will discuss the powerful potential of super-resolution microscopy and related technological innovations offering new ways to study photosynthetic proteins and other molecules involved in dynamic biological processes. “Hosting two Nobel laureates on campus in less than four months underscores the high quality of teaching and research occurring here at WSU,” Saam said. “We were able to attract these prominent people to meet with our students and faculty through the professional relationships that our faculty and researchers have with them,” he said. Moerner is the Harry S. Mosher professor of chemistry and department chair at Stanford. His research interests span methods of precise quantitation of single-molecule properties, to strategies for three-dimensional imaging and tracking of single molecules, to applications of single-molecule measurements to understand biological processes in cells, and observations of the photodynamics of single photosynthetic proteins and enzymes. He has been an elected fellow/member of the National Academy of Sciences, the American Association for the Advancement of Science, the American Physical Society, and the Optical Society (OSA). His other major professional awards include the Earle K. Plyler Prize for Molecular Spectroscopy, the Irving Langmuir Prize in Chemical Physics, the Pittsburgh Spectroscopy Award, the Peter Debye Award in Physical Chemistry, and the Wolf Prize in Chemistry. The S. Town Stephenson Distinguished Lectureship brings prominent thinkers in science to WSU audiences. It honors the late S. Town Stephenson who joined the WSU faculty in 1934 and whose notable research in physical sciences at WSU concerned the propagation of radar waves and the low energy x-ray region. The Department of Physics and Astronomy in the College of Arts and Sciences offers bachelor’s, master’s, and doctoral degree programs that blend coursework with cutting-edge research. Current faculty expertise spans astronomy and astrophysics, optics, fundamental quantum technologies, condensed matter, and applied physics. Gifts in support of the S. Town Stephenson Distinguished Lectureship are welcome.